Remember Baxter the Robot? 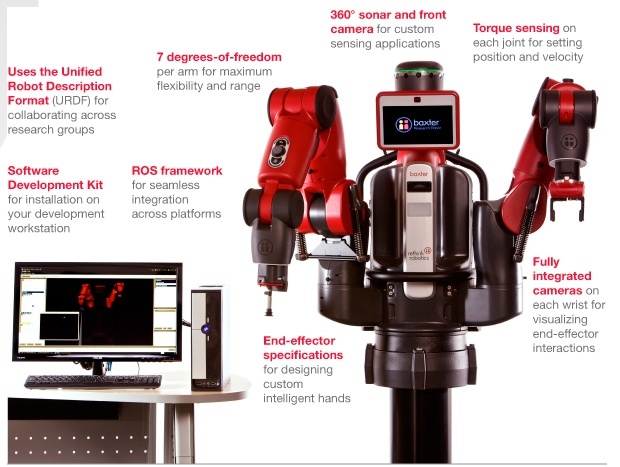 The $22,000 machine initially built for manufacturing applications can now be repurposed for research tasks, according to Rethink Robotics. Baxter’s advantages lie in its ability to “learn” tasks from a person who walks it through a series of motions. The trainer need not be a computer programmer. And, because Baxter is sedentary — it doesn’t roll or walk around — there is no need for protective cages to separate it from human co-workers. For tasks that can be performed at a countertop or an assembly line, Baxter could be an ideal worker.